The Georgia Bulldogs released four-star offensive lineman and signee D’Antne Demery Sunday afternoon, and he will not be admitted to the university, per the Macon Telegraph. 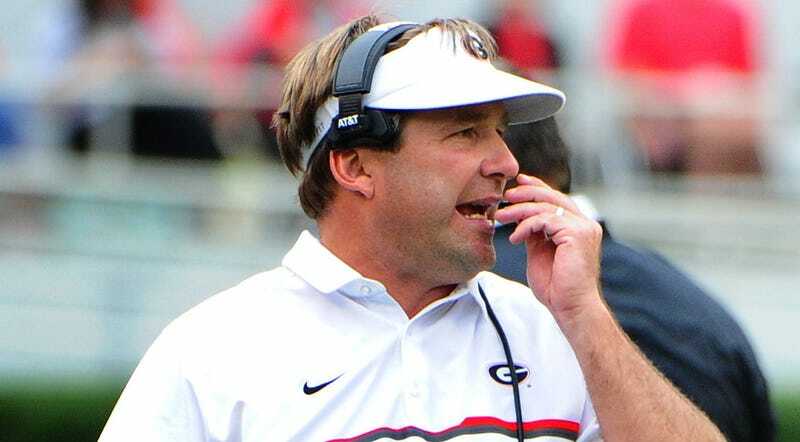 The move, made by head coach Kirby Smart, came a day after Demery was arrested and charged with simple battery and criminal trespass after an employee at Waffle House saw him choking his girlfriend, with whom Demery has a 1-month-old baby. “On 04/22/17 at approximately 2115 hours, Downtown officers were dispatched to the area of the Waffle House, in reference to a black male choking (strangling) a female. Upon arrival, both individuals had left the area. Moments later, the victim called 911; advising that she wished to press charges against D’Antne Demery for hitting her. Contact was made with the victim in front of Boars Head. “She stated that she and Demery got into an argument; he began to get loud, she started to walk off, he told her ‘walk off again, and Imma show you.’ She began to walk away again, at which point, Demery came from behind her; grabbing her on the back of her neck; pushing her against the wall, and also grabbing her by the hair. They were eventually separated by friends. Demery was eventually able to reconnect with the victim, in which he threw her; causing her glasses to fall off, and her phone fell out of her hand; causing it to hit the ground which resulted in a crack to the screen. Drayton told Georgia student paper The Red & Black that the altercation originated from Demery’s desire for her to stay behind at the hotel while he went out in downtown Athens. The two were in town for Georgia’s spring game, which took place on Saturday. Drayton said she stands by what she reported to police but no longer want to press charges against the former Bulldog. The Telegraph reports that 15 minutes after they called the Athens-Clarke County PD to inquire why Gantt was listed, his name was replaced with Brandi McMaster, who posted Demery’s bond. The witness in the case was Demery’s friend and preferred walk-on for Georgia, Brandon McMaster. In speaking with The Red & Black, he denied Demery strangled anyone, claimed the phone screen was cracked prior to the alleged battery, and said that Drayton initiated the physical contact. Demery signed his letter of intent on Feb. 3 and planned on enrolling in summer courses at Georgia starting in June; he has since been released from that letter, allowing him the option to sign with any team in the nation and play in 2017. Had he not been granted a full release, he would have been required to sit out a year before playing for any SEC teams, based on league rules. The SEC also has a rule in place preventing member schools from signing transfers with a history of domestic or sexual violence; as Demery would be joining a team as an unsigned recruit and not a transfer, the rule will not apply.